Crap definitely hit the fan for our heroines, I wonder how they'll get out of that perilous situation. I like how the characters have changed (especially Nanoha. Seems like Fate succeeded to warm her cold heart, haha). I also like how the story is going. It is so interesting. And there are such awesome sentences that they just make me want to squeal. (Yeah, the 'be one with me' was part of it). As usual, the cavalry always comes just at the right time to play their fine "Big Damn Heroes" moment. Thank you! You are doing a great job!! OMG. This is another EPIC chapter. I hope I'm not over-reacting, but I seriously love this chapter. THAT scene especially, anyone knows what I mean by that? *ahem*bath scene*ahem* (Lol) Thanks for the update! Awesome! This was another GREAT chapter! Can't wait to see more! And I do believe this kind of chapter must be hard to translate, so thank you for your hard work! You did a wonderful job, like usual. 'Be one with the sword, be one with the earth, be one with the air'. This sentence always succeed to make me shiver. Every time. SO awesome! How many chapters are there in total? 38 plus the prologue (the 38 is the epilogue). About 347.000 words. You're the author of this novel, right? I just want to tell you that I'm enjoying it a whole lot! (And that I envy your incredible imagination, haha). I'm such a big fan! Yes and thank you, I´m glad that you are enjoying the story ^_^. Just three things before the chapter. Secondly, as you now know, we haven't even reached the half-way mark, so believe me, there's many surprises ahead. Be prepared to be amazed (it'll be useless, though, nothing can prepare you to what Nura came up with). Thirdly, and the only really relevant thing, while not overly graphic there is Mature Content in this chapter. I don't plan on warning you if/when it'll happen again in future chapters, so consider yourself warned for the future too. And it seems things will get really serious, this mysterious empire looks like to be extremely strong. First of all, thank you so much for putting the time and effort into translating such a great piece of literature for us non-Spanish speakers to read and enjoy! I know how hard it is to translate several-thousand-word chapters to another language (even though I haven't translated anything myself but I just know ok D; xD) so thank you! Well, well... It was a very interesting chapter like usual. It was also somewhat funny at some moments and I couldn't help, but smile stupidly in front of my screen while reading some lines. (Like when Fate gets embarrassed and all). And I also like the changes in Nanoha's personality. It was a rather relaxing chapter, but still very good nevertheless. I really wonder what will happen... Mm... I also have the feeling things will get very serious again soon! And I'm really glad to learn we still have a long adventure that awaits us, hehe! Ok, finally here's chapter 16, just a fair warning, there's a rather crude scene, and I mean it as violent and upsetting. But there's also a squeal-worthy moment. anyway, I shouldn't give spoilers, so here it is. That's quite the shocking revelation for Nanoha. Since you're here, can I ask about "Treados" too? At first I thought it sounded similar to 'traidores', but it could just be me trying to apply my thoughts and knowledge of them to the term. "Treados" is another invented word too, nothing to do with "traidores", although when you look to their history, yeah, kinda fit it. 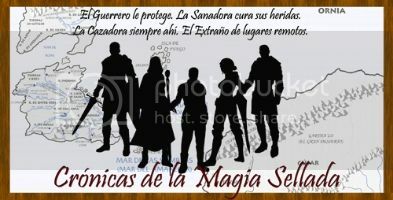 But when I first thought about the Treados, I didn´t have in mind their whole history with the Sarmios, that came later (it´s the way I write a story, building it along the writing process). THANK YOU THANK YOU THANK YOU BOTH OF YOU! TOTALLY MADE MY DAY! Oh I totally didn't expect that plot twist at all. o.o It's just getting more and more interesting by chapter! Looks like another bit of calm before the storm.